Click HERE to get your FREE copy of Dotcom Secrets! I personally took advantage of this FREE BOOK offer and got my copy of Expert Secrets by Russell Brunson. No strings attached, you pay the shipping and the book is absolutely FREE. HOWEVER! If you are anything like me you are going to learn a ton from this book and love it and will be back for more. Before I had finished reading Expert Secrets, I had ordered my FREE copy of DotCom Secrets too! Russell is mailing you an actual physical copy of his new book, it’s not an e-book. The book is free, and all you pay is the shipping costs. There’s no catch… no gimmicks… You will NOT be signing up for any “trial” to some monthly program or anything like that. So click here to claim your free copy now. You won’t regret it. There are Limited Copies available but while they last feel free to share this link with others! …and each plan is DESIGNED to start out from ZERO. Even if you’re starting out truly from “Square One”…this summit is pre-engineered for YOU to succeed starting from SCRATCH! Click here to reserve your spot for the free 30 Days Summit Event! We are all trying to do the same thing. We all need our content to be seen by more eyes. But more importantly, we all need our content to be seen by more of the right eyes. We are all working so hard to get in front of our potential clients, but are we doing it the right way? For the past number of years I have been working with Eric Chang from Airau Marketing for my online strategies for Kodiak Mountain Stone. Eric is brilliant and is always taking things in exciting, new directions. Now Eric is giving you the opportunity to learn from his expertise to get your online content in front of the eyes that matter. SEO (Search Engine Optimization) is so vital for you to get your information in front of the right people. People are out there looking for your product or service, but without the proper SEO they are not going to find you. 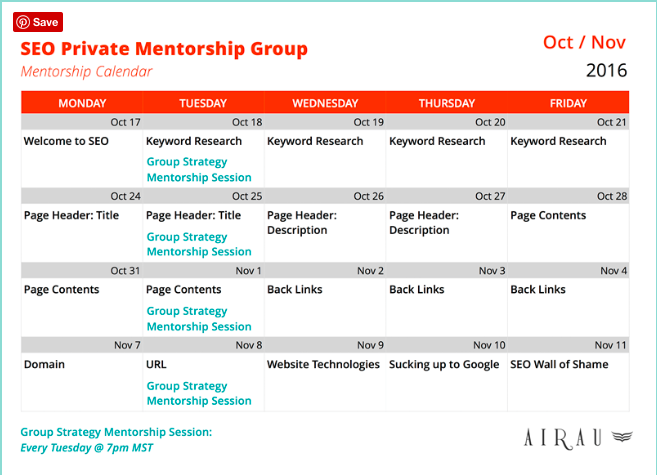 Eric will be launching an SEO Private Mentorship Group! You do not want to miss out on this opportunity to learn from one of the best. I think that Eric should be charging thousands of dollars to be sharing his knowledge and expertise with this group, and I know you would feel that it was an excellent investment at such a price.